My Pet Food Myth series brings me to Myth #6.. 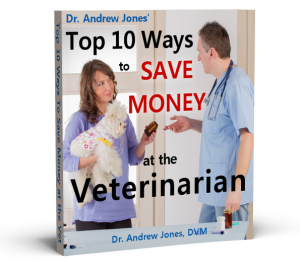 The #1 vet recommended brand is probably the #1 worst pet food value..
.It may not even be nutritious.. I learned NOTHING about nutrition in veterinary school. The little education I had came from the Science Diet or Iams Rep.. The majority of vets know very little about pet nutrition. The public is told to, “Ask your vet”. The vet is told by the pet food companies, “we’ll send you to Hawaii for a week of golf if you sell and endorse XYZ brand pet food”. In school, vets-to-be could ELECT to take an overview course in animal nutrition. There have been changes of late to make this required study. AS IT WELL SHOULD BE! You are miles ahead if you understand the pet food label yourself and take the time to learn some basic nutritional concepts. For example go to your vet and read the label on their recommended food. Compare it to the cheapest stuff you can find. There is little difference in most cases. How much does it cost them to make a 40 lb. bag of this stuff you may wonder…..
How about less than $3 including the cost of the bag? How much does the duped public shell out for the bushel of corn and peanut shells most recommended by vets? Find out for yourself, trust your own judgement and ignore what people say who are getting paid to say it.